I LOVE Athleta catalogs. The women shown are strong, athletic and diverse. They’ve always shown women paddleboarding and I honestly thought I wouldn’t have the opportunity to try it unless I were to go to the ocean. 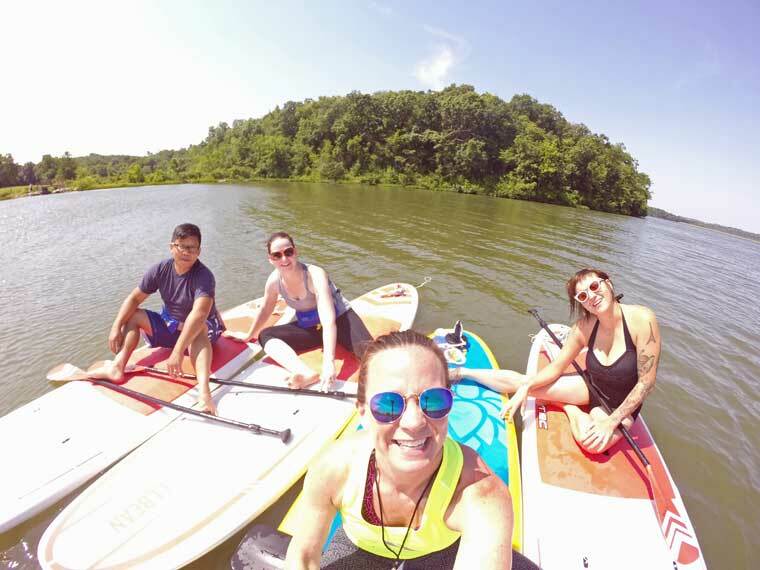 But then a friend of mine recently got her stand-up paddleboard (SUP) yoga certification (Positive Vibes SUP + Fit) and brought it to Kansas City! As soon as I saw a date and time on the schedule that I knew I could make, I signed up. Of course, there were the hesitations. What do I wear? It’s yoga. On water. I was positive I didn’t want to be doing yoga in a swimsuit and she said wear anything I wouldn’t mind getting wet. Check. 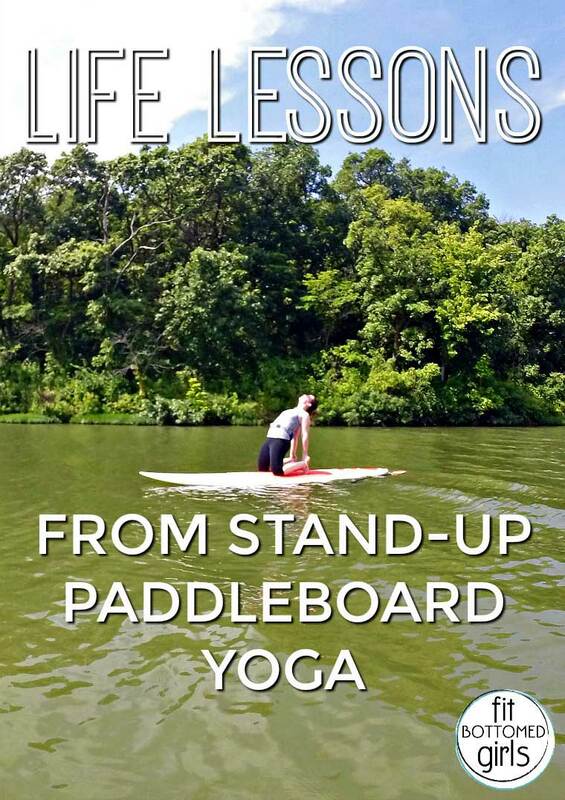 Then I asked how stable the boards are and she said if you can stand on one foot on dry land you can do SUP yoga. Check. The day of the class I realized that I wasn’t as nervous about falling in as I was about getting back up on the board. Would I be able to do that or would I be stuck in the water? When I was out on the water, I realized there are so many ways that this experience mirrors life. There’s the thrill of something new and exciting. There’s the uncertainty leading up to it: Will I fail? Will I recover? Then there was the easing in. And then there was the instability as I was learning something new while applying all my previous experience to this situation. And finally came relief and eventual trust of myself and the board. About halfway through the class I realized I had a lot more room for movement than I realized. And I was able to take bigger risks. Relax more. Laugh more. Learn to trust myself more. Then it was over and time to go back to shore. The day I went might have been the windiest day all month, so on the way back to shore, there was the feeling of getting stuck in the middle of the water going against the wind, no matter how hard I paddled. And I just kept paddling and started moving again and eventually I was back on dry land. Back in my comfort zone, just like real life. Being stuck and working through it. But I did it. I did this new thing I didn’t think I would ever have a chance to do and I learned about myself and how it would have been so easy to not go. In fact, there were two people who didn’t show up to the class. And there were two people who didn’t show up to the class the night before. So fear could have definitely taken over, but I decided that it was more important to walk through it than it was to hold back. While I did this new thing, was it scary? Not really. There was a warrior pose that was more unstable than I would have liked, but I modified it and was fine. I survived. It was the fear of not getting back on the board that was scary — just like life. The fear of not being able to recover from upset is much worse than the actual experience ever is. We learn to move on and get through it and we survive, proving to ourselves how brave we are. And isn’t that what life is? Trying new things and learning to move past the fear? And then choosing to continue living that life, instead of the one based on fear. The next time I go, I’ll push myself harder and see what happens. I’ll give myself a greater opportunity to fall so I can also give myself the chance to get back on the board. Nice article! 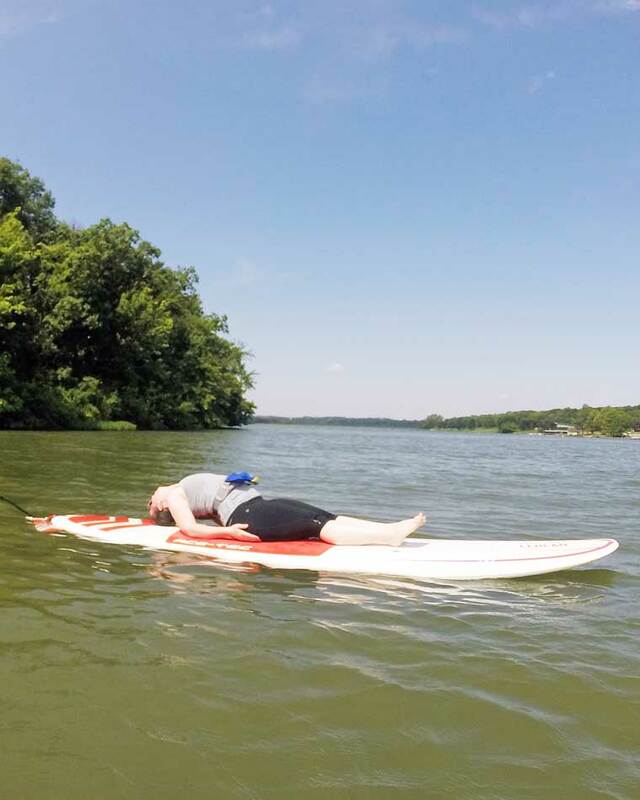 It must be hard to relax on a stand up paddle.